Ireland and the United States enjoy a special connection. As St. Patrick’s Day approaches, so too does an opportunity to explore perceptions of the Ireland-United States relationship in the United States. 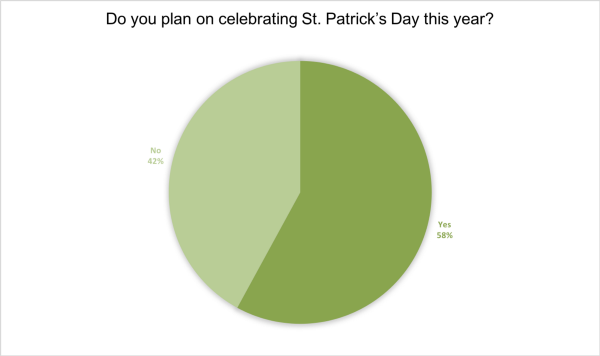 Over half of Americans, according to a new Publitics/Lenox Consulting survey, plan to celebrate St. Patrick’s Day. 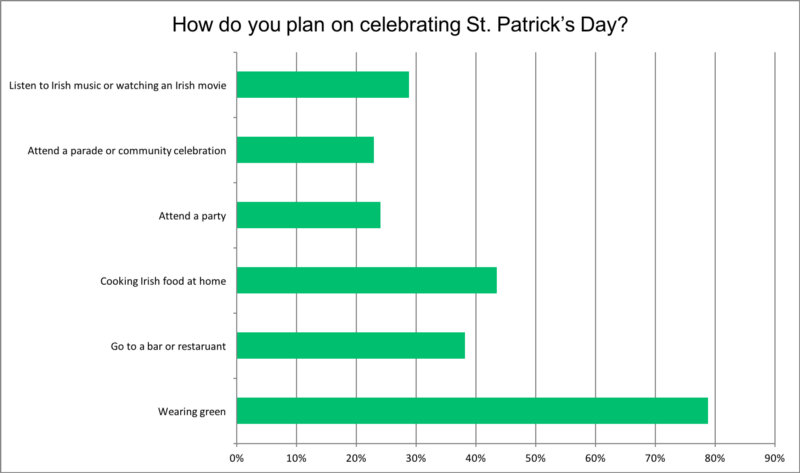 Of those who plan to celebrate, the most popular ways to mark the day will be wearing green (80%), cooking Irish food at home (44%) and heading to a bar or restaurant (38%). 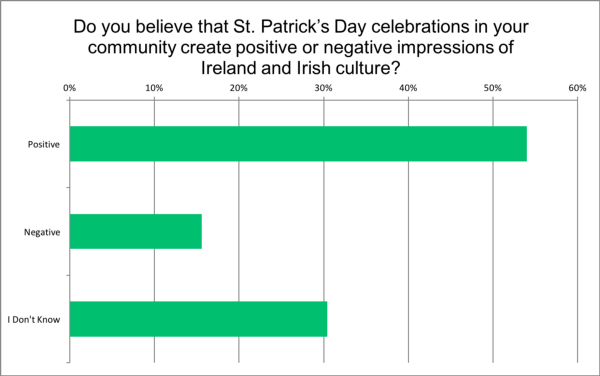 Similarly, over half (56%) reported that St. Patrick’s Day celebrations create positive impressions of Ireland and Irish culture in their communities. Because such a wide swath of Americans annually make plans to celebrate St. Patrick’s Day and view the holiday favorably, there is an enormous opening to further introduce Irish brands to the American consumer. Outreach efforts, such as the #WearingIrish campaign, have taken advantage of the platform St. Patrick’s season creates in the U.S. by moving beyond “wearing green,” and showcasing Irish clothing and accessory designers, while events like Fareplate focus on showcasing Irish food. 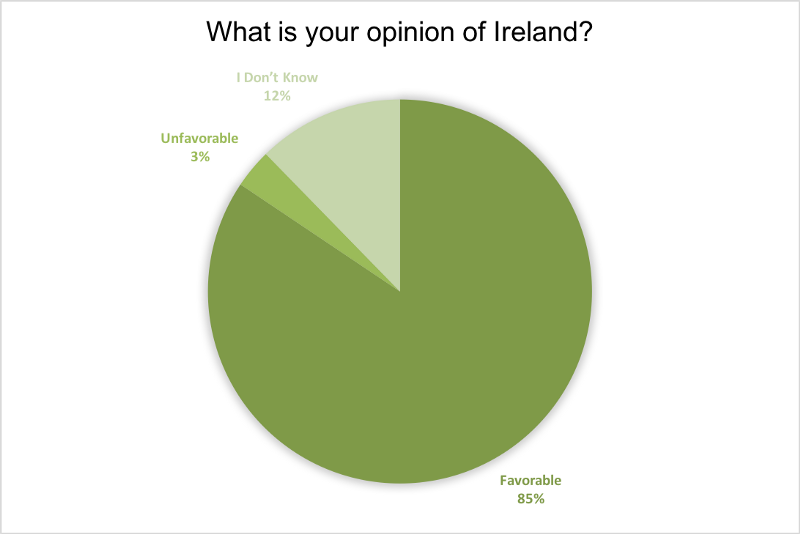 When looking at the Irish brand itself, it receives high marks, with 84% of Americans reporting that they have a favorable impression of the country. 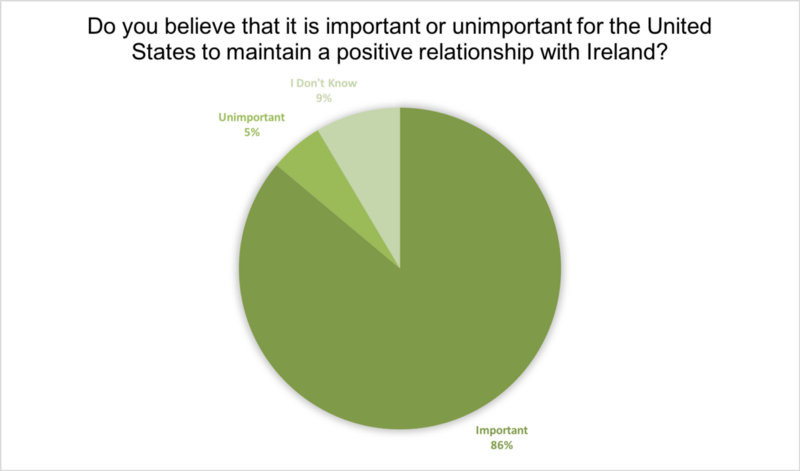 When it comes to the relationship between Ireland and the United States, 71% believe that the two countries have a positive relationship. Tending to that relationship is a priority as well, with 86% reporting that it is important for the United States to maintain it. 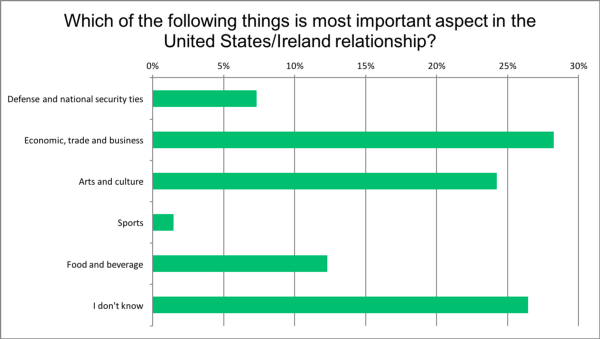 Turning to the specifics of the Ireland-U.S. relationship, just over one-quarter (28%) of our respondents cite economic and trade ties as the most important aspect of the U.S. relationship and slightly under one-quarter (24%) reporting the same of arts and culture. Food and beverage (12%) and sport (1%) lag behind. The United States is Ireland’s top trading partner, with 23% of Irish exports going stateside. Likewise, the U.S. is a top exporter to Ireland. Additionally, about 700 U.S. owned firms have a presence in Ireland. Another opportunity for further growth is travel. Over 1.2 million Americans traveled to Ireland in 2016. 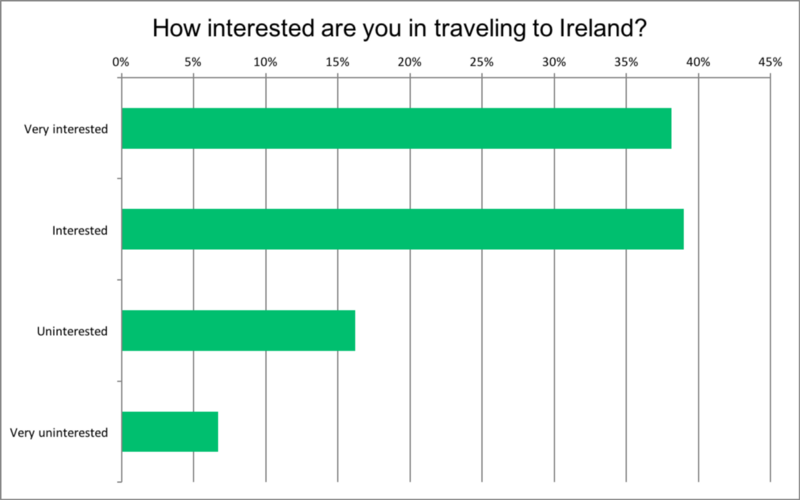 That number will likely continue to rise, with 77% reporting that they are open to travel to Ireland (38% are very interested and 39% interested). Robust place branding and efforts to open up new options for air travel to cities outside of Dublin will be useful in reaching further into the American market. The first annual St. Patrick’s Day survey is a collaborative project between Publitics and Lenox Consulting. 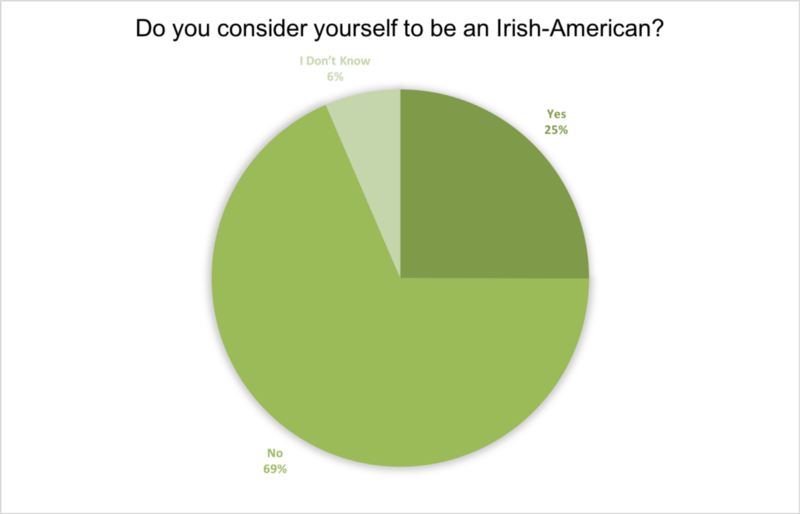 The survey explores American attitudes about the St. Patrick’s Day holiday and perceptions of the Ireland/U.S. relationship. Steve Lenox is Founder and President of Lenox Consulting, a international boutique public relations and public affairs firm with offices in New Jersey and Ireland. Steve also serves as President of Irish Network USA, a national nonprofit organization with chapters across the United States,that provides a vehicle and resource for Irish, Irish-Americans, and friends of Ireland to invest in Ireland through business, arts, culture, education and sport. He is currently an adjunct professor at Centenary University’s business department, teaching in their first-of-its-kind social media program. Prior to founding Publitics, Matt worked at Fairleigh Dickinson University’s PublicMind Poll and later taught freshman seminar for political science students and in the Law in the Liberal Arts program as an adjunct instructor.